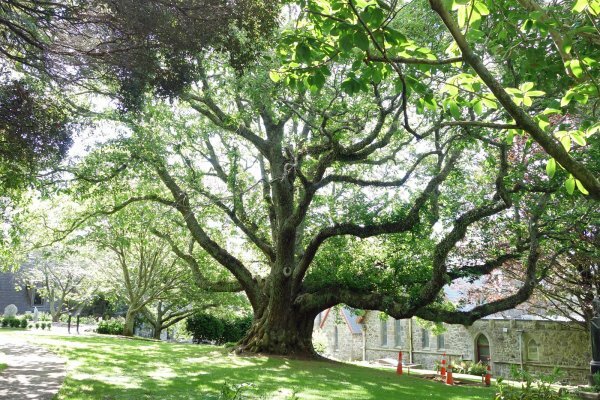 The largest tree is an impressive Spanish chestnut, between the church buildings and the foot of the adjacent Marsland Hill, the site of a British Army barracks from 1856 until 1870. During that time, the churchyard was used as a bullock pen, and as a magazine during the Taranaki Land Wars of the 1860's. It is likely that the tree, and others around it, were planted after that time. Photographs of the churchyard from the early 20th century show the churchyard plantings, including this tree, well established at that time. Burstall did not make note of this tree in his 1973 report, preferring three other trees of the species from around the region, and the magnificent chestnut at nearby Brooklands Park. That tree, described by Burstall as one of the outstanding exotics in the country and known for its immense spread (almost 43 m), died in 1977. 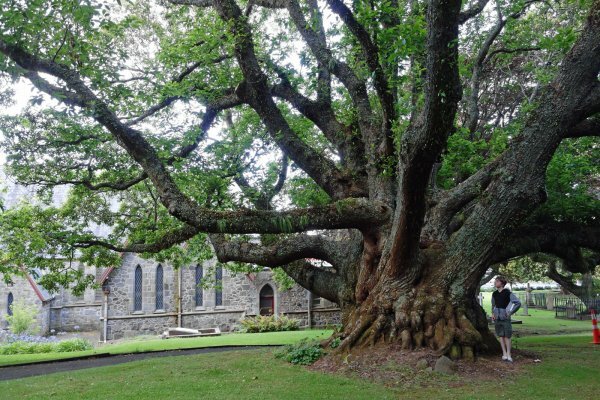 In comparison, the tree at St Mary's is now significantly larger in diameter, but still smaller in average spread. Measured at narrowest point, below low branching. Appears to be in good health. A number of stems fused near ground level.